Eugene, Oregon: Writers House Books, 2000. 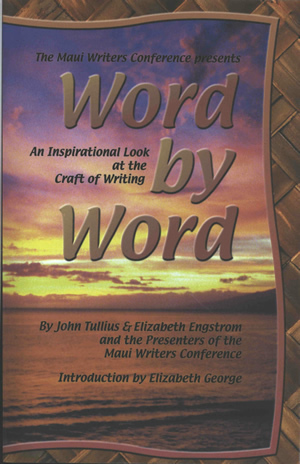 This is the paperback edition of Word by Word: An Inspirational Look at the Craft of Writing by John Tullius & Elizabeth Engstrom, and the Presenters of the Maui Writers Conference. It was published in 2000 by Writers House Books in Eugene, Oregon. The book contains a transcription of a speech given by Tony Hillerman called "The Last Eagle" beginning on page 31. The book design is by Alan M. Clark and the cover art is by Robert Glick. The front cover background is an illustration of sunrise or sunset over the ocean, surrounded by a border resembling strips of woven wood. The book title and author names are overlaid on the photograph. The front cover illustration and border wrap onto the spine, where the book title, authors' names, and publisher's imprint are printed in black. The back cover is beige with the headline "The World's Finest Writers Share the Secrets of Their Success" in black, above lists by category of author names included in the collection. The bar code is at the bottom of the back cover. The inside front and inside back covers are blank.